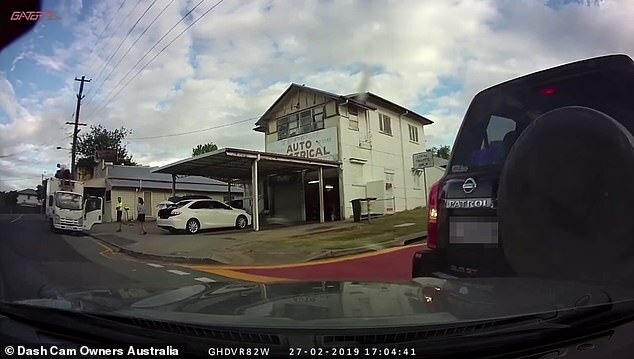 A driver who reversed into another car, causing an accident, has been branded ‘arrogant’ after he reportedly lied to insurers in an attempt to get out of paying. The victim, Barry, told the driver of the black 4WD on three separate occasions he had caught the entire incident on dash cam footage. But Barry told Dash Cam Owners Australia the driver chose to ignore the warnings and lied to insurers. ‘He tried to tell the insurance that I went to overtake him further down the road despite me telling him three times that I had a dash cam,’ he said. 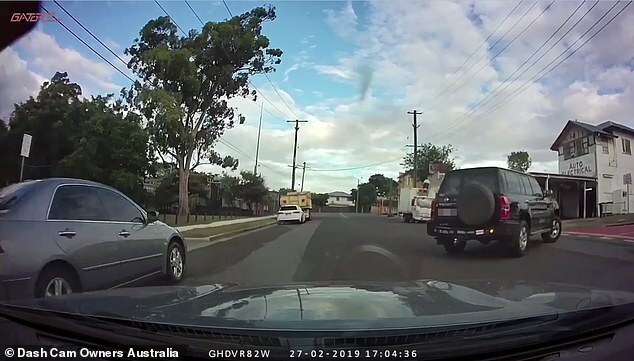 In the footage, the at-fault driver turned right through an intersection on a Queensland road. He was followed almost immediately by Barry. But within moments of Barry making the turn, the driver in front put his car in reverse and smashed straight into the dash cam owner’s car. When the footage was shared, social media users were quick to address the driver’s sneaky tactics – and told Barry he was fortunate to have had the proof. ‘If you didn’t have dash cam good luck explaining he reversed. Without the cam car behind always in fault,’ another added. Others pointed out that while the driver was at fault, the dash cam owner may have been driving too close to begin with.